BEFORE: Back in Boston ready for school to wrap up it’s final weeks and movie marathon chugs along with a poorly received film, Cowboys & Aliens. Cowboys & Aliens*. Despite having been met with bad reviews from critics, I want to give this film a chance because it does star Daniel Craig (last seen in Skyfall) and Harrison Ford (last seen in Blade Runner) so I’m confident there’ll be at least some entertainment. The question is, will the bad outweigh the good? AFTER: In the spectrum of film, I think the two opposite ends are pure spectacle (see: no story, just explosions and eye candy) and a complex and meaningful drama (see: lots of nuanced story points and character development). Of course there is also a lot of area in between the two ends that movies can fill. Cowboys & Aliens is a spectacle film that tried to be meaningful. Cowboys & Aliens is by no means a bad film. Sure there are some bad elements in it, but for it entertained which is much more than some of the critics were saying. With Jon Favreau (director of the first two Iron Man films) at the helm and a strong cast at his back, it would be pretty hard for this film not to entertain. Besides the strong cast there was some really great eye candy. The aliens and the weapons were all done very well and it showed something not really seen before; aliens in the Wild West. But the downfall of this film is that it tries to go away from just being a spectacle. The writers focused too much on the flashbacks and the mythology of the aliens that it took away from the excitement of the action. Instead of being able to sit back, relax, and watch a Transformer-esque film just to see stuff blow up and aliens shot to pieces, I need to think about some deeper meaning. That’s all fine and dandy and I love films that aren’t just straightforward. However, Cowboys & Aliens is not that kind of film and yet it still tries to do that. As a result, there’s much more questions than answers and many of the exposition scenes (the flashbacks mostly) seem completely out of place and unnecessary. Cowboys & Aliens is still an entertaining film. To see James Bond and Indiana Jones work together in the same film is extraordinary and amazing. 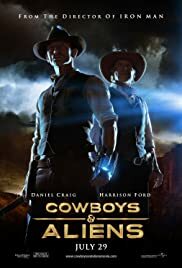 If you’re ever looking for an action film to watch over the summer when you’re bored, Cowboys & Aliens should fit the bill quite nicely. But by trying to not be the next Transformers, Cowboys & Aliens ended up being a little less entertaining than it could have been.